Martina Vuksan 27. 5. 2014. Kei Shimada, the global director of innovation and business development from Tokyo, presented a breathtaking insight into the future technology which is about to change our lifestyle. As he mentioned at the beginning, he came to Marketing Rockstarts Festival in order to give us all a glimpse of what’s happening in Japan, because it should matter to all of us in terms of marketing and understanding innovation. Kei Shimada at Marketing Rockstars Festival in Graz. Kei Shimada, the global director of innovation and business development at Dentsu from Tokyo, presented a breathtaking insight into the future technology that all marketers should keep in mind. As he mentioned at the beginning, he came to Marketing Rockstarts Festival in order to give us all a glimpse of what’s happening in Japan, because it should matter to all of us in terms of marketing and understanding innovation. 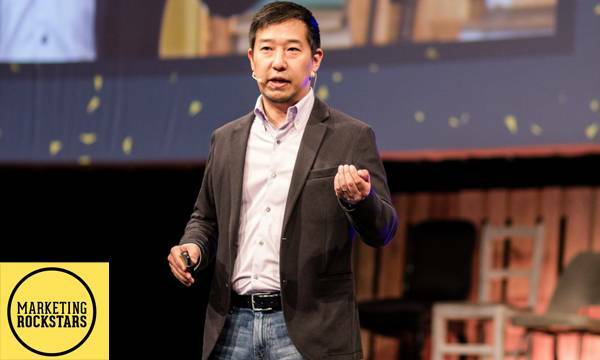 Being a traveler, entrepreneur and a keynote speaker, Kei has focused on helping companies around the globe redefine existing product and service strategies, develop and execute market entry strategies, enhance existing revenue streams or create new ones from the ground up network connector. I travel the world to talk about what’s happening in Japan and what everybody can expect in the terms of innovation. Japan is a homogeneous society, and Japanese people are known for their long-term vision. And it pays off in the end because we can create very sustainable things from our vision. Japan was the first one with mobile email, mobile internet, and NFC phones from 2004. So, we were swaging our mobile phones at boarding planes, train station, buying things in stores and checking in hotels. The whole economy and ecosystem is created around this vision, to make it work and make it happen, to create something that is important for people, customers and clients. As Kei mentioned, mobile phones are always in our pockets, within our hands’ reach. Therefore, it is very important that we focus on the touch points, make people interact with mobile phones to make the economy work. Also, Japan was the first one with the McDonald’s digital vouchers sent to their customers’ mobile phones in order to deliver coupons or offer them payment via their mobile devices. We were focused on mobile phones because PCs were very expensive in Japan, so we decided to put digital TVs on our phones. Therefore, the majority of phones from 2007 have digital TV. It was very affordable for everybody. Kei Shimada explained how it is very important for marketers to focus on creating this craving habit. He took out a quote from the book The Power of Habit, which says: – there’s a cue, there’s a routine, there’s a reward. In Japan, marketers and innovators rewarded people for using mobile by creating convenient things for them. Kei said it is necessary to create a habit for eco-system to work. Japan is also known for the fastest tweets per a minute that was broadcasted on TV in 2013. We are the largest e-commerce, and have invested in Pinterest, too. Advertising on buses has been around for ages, as Kei said. He asked the audience, what happens when you use a car that is surrounded by an LCD display and becomes advertiser? It becomes very personal, it becomes very connected, and gives a new meaning for mobility. In 2001, there was a big earthquake and Tsunami in Japan. Ever since, we’ve been energy conscious. What if you can visual the behaviour of people using their GPS signals? Of course, there’s a privacy issue, but if it’s used for good cause it would help you understand about people’s activities on a certain day or time and get meaning from it in the terms of marketing. Here, Kei showed a picture of people’s activities on the day earthquake hit Tokyo. He showed lines which presented people’s movements at a certain time of hour, people coming in and out of Tokyo, as well as their behaviour when the earthquake happened. This kind of technology can find your clients and see where they’re coming from and where they’re going, how long they reside in your store, at your park or at the tourist attraction. It goes beyond taking surveys, having people filling up the forms. If we could use their GPS and location based on information like this, it could be a very powerful thing. Kei said that if we could take advantage of an extraordinary powerful tool like that, marketers could understand their customer’s real-life behaviour. There are a lot of people who buy wearables these days. Kei said he was equipped with 3 of them at the moment of his presentation. He predicts that by 2018 the wearable market will be extremely big, worth approx. 3 billion dollars. Google better hurry up, because this is going to be out next spring! We can’t wait for Google forever. Kei explained how all these wearable technologies will soon be placed in just one component that we will wear during the day. I like this quote: If you can’t explain it simply, you don’t understand it well enough. I always think about the nonverbal communication and the ways of me interacting with my boss without having to say a word. This came out of the napkin drawing 4 years ago from a colleague of mine who wanted to tell and show anybody around her which emotional state she’s in. Necomini brainwave cat ears have a sensor placed on the forehead, which senses whether you are focused or relaxed. When the ears are sticking up, you are focused, but when ears are flat, you are relaxed. It looks funny, but this is named one of the top 50 innovations in 2011 according to Time Magazine. Brainwave technology is here to enhance people’s experience. For example, Neurocam keeps track of all your interesting moments based on the level of your interest. It identifies 5 emotional states of the brain and quantified them from 0 to 100. It will record your interest, so whenever you’re looking at something and you interest level exceeds a certain level, it automatically starts recording. Kei even brought a working prototype with him, so anybody who wanted to try it on was free to do so. This is just a way of experimenting with new technology. It’s an innovation, but it’s something that you should look forward to because this would probably replace ethnography and traditional means of survey. A lot of the things I’ve shown you are strange things, and they are called innovation. But, 3 to 5 years from now you might look back and say: That Kei Shimada was right! Kei ended his presentation of the amazing technology coming from Japan by explaining why he accepted the invitation to join Marketing Rockstars Festival in Graz. He said he first didn’t think that marketing and rock stars go together, but what he liked about it was the organizer’s innovative way of approach for combining marketing and rock stars in one. Kei’s news from the future made a huge impact on the audience, and some of us even tried one of the next generation wearables he brought along. Yes, they are amazing indeed! Digital Marketing Specialist at Lipa Learning - a Prague-based award-winning developer of educational apps for kids which provide the highest standard of early age education and support the age of mobile learning. Martina is also a blogger, creative writer, in love with Social Media and Content Marketing, Author of English Workbooks and Interactive games for kids. She was also a contributing writer at Babel Guide (Prague) and Digital East Factor (Munich). Announcing the 2-day conference showcasing top notch topics in product management. Andrea Grisogono 25. 10. 2017. At their 10th anniversary, the Slovenian high-tech company Zemanta d.o.o. announced that it was entirely acquired by Outbrain from the US, the world’s largest premium content discovery platform. The sum that Outbrain paid for Zemanta’s technology, products and team remains a business secret, and Zemanta’s co-founders Andraž Tori and Boštjan Špetič will join Outbrain. After becoming part of Outbrain Zemanta’s platform will continue to operate as a standalone product. Ana Eterović Klemenčič 31. 7. 2017. Novathon #withPBZ is getting closer. This 24 hour-long brainstorming, coding and design event will attract designers, developers, students and others interested in creating a banking app, and the winning team will go home with as much as €10,000. Besides the mentors, the teams will be motivated by the financial expert Chris Skinner, to whom we had the opportunity to talk about the state of the financial technology industry. Ivan Šimić 24. 7. 2017.